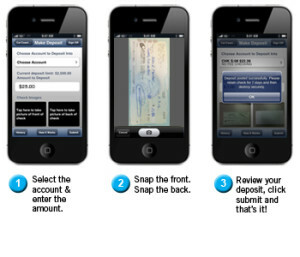 One of the most popular consumer banking services today is mobile check deposit. Use of PCs and desktop scanners to facilitate banking deposits has been available for some time. However, only within the last year or two have consumers had access to simple applications that would allow them to make deposits on the go without a trip to their bank or credit union. Using a smartphone and free institution specific smartphone applications, any consumer or small business can deposit one or several checks within a couple of minutes using nothing more than the bank application and camera on their smartphone. 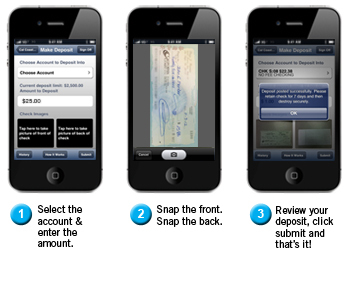 A simple on-line application steps you through the 1,2,3 of Mobile Deposit. Once logged on to their banking website, users are stepped through a simple data entry process and instructed to photograph both the front face and the fully endorsed back side of the check. Review and submit. Voila! The check is deposited and a confirmation number and optional email is received back from the bank in lieu of a deposit slip. Consumers are asked to keep the check documents up to 90 days before disposing of the original. That two minute drill beats the heck out of multiple trips to the bank for the deposit of miscellaneous checks we all receive, be it payroll checks, mineral royalties or reimbursements. More often than not, most of us get sidetracked and hang onto miscellaneous checks much longer than we should. “Time is money” …and nothing reflects that old adage more so than the time saved by not having to make trips to the bank. Furthermore, money in the bank is making interest, at least more than if the item is lost for weeks or months in your dresser drawer! Surprisingly, fraud using mobile deposit is reported as minimal and security is a non-issue. Most credit unions report that they restrict use of mobile deposit services to established customers of several months and impose maximum mobile deposit limits of usually $5,000. Consumer behavior is carefully tracked, much like credit/debit card usage, and discrepancies are quickly identified and investigated. Systems are in place that quickly identify duplicate deposits of the same item. We strongly encourage the use of mobile banking for our clients and have found it to be one more way to make the daily money management for clients more efficient and cost effective. When we save time providing a service, the customer saves money. Are you on the mobile deposit train with your bank or credit union? If not, RUN and catch it! That train is leaving the station and you need to be on it! make it 100% unique and pass copyscape test?